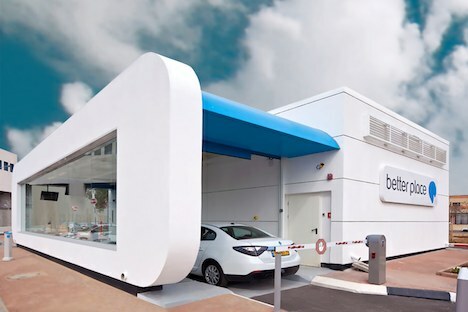 After months of delays and $400 million in outlays, American-Israeli company Better Place has finally begun rolling out its much-anticipated electric vehicle network in Israel. When all is completed, Better Place will have at least 40 EV stations across the country – enough to allow a motorist to drive 500 kilometers from Israel’s northern tip to the southern end. Although many would raise scepticism regarding the effectiveness of such an ambitious EV network, Better Place is basing its success on an innovative new approach. Rather than exclusively providing EV owners with a place to charge their cars, Better Place will allow motorists to exchange their depleted batteries with fully-charged new ones. These new “battery swapping stations” will allow EV owners to circumvent lengthy charge times and instead get a full charge in a fraction of the time. The amount of time required to fully charge an EV at a typical charging station is 6 – 8 hours. Such a lengthy charge time can stifle interest in EVs due to range anxiety – the fear that one will run out of juice before reaching their destination. Range anxiety is a legitimate concern because EVs can usually go only 160 kilometres per charge (about 100 miles). But at Better Place’s battery swapping stations, one can swap out and replace a depleted battery in less than 30 minutes. Better Place has partnered with Renault to offer a customized sedan called the Fluence, which features a special swappable battery. Leasing companies in Israel have already ordered 1,800 of the new cars, with private customers purchasing several hundred more. Within a year, Renault predicts that about 5,000 Fluences will hit Israel’s roads. Although Israel is the first testing ground, Better Place has plans to rollout in Denmark and Australia. What are your thoughts Better Place’s EV battery swapping stations? Do you think this is the future of EV charging?